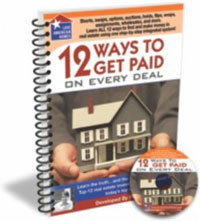 “12 Ways To Get Paid On Every Deal” is a content-rich, 2-hour class where I walk through 12 unique ways to buy and sell houses, ensuring that you get paid on every deal no matter what strategy you’re using. A lot of investors “leave money on the table” by pigeon-holing themselves into one narrowly focused strategy. For them, their “comfort strategy” is like a square hole… and only deals that are a square peg are going to work. This mindset just doesn’t make sense (unless you want to stay broke). This Training Program will teach you how to look at any deal and determine how to get the deal done… and most importantly, how to get paid. Click below to navigate to each video.